Home > AlAnabi Racing > Drag > DragRace > News > NHRA > MIKE JANIS : We will keep digging...No sleep till Sunday night October 28th in Vegas! 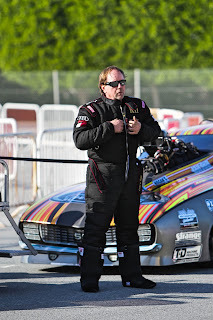 raced to current Pro Mod No. 1 qualifier at AAA Insurance NHRA Midwest Nationals with his violent Al Anabi/MJ Supercharged Camaro posting an easy 5.725-seconds at 248.02 mph. After they day of qualifying with a lowest ET 5.725 this w was definitely the team to look out for at the elimination but things didn't pan out as they had planned. Even as Mike Castellana (another Al Anabi team) upset the NHRA E.T record, Mike Janis were still shaking the ladder at St Louis. 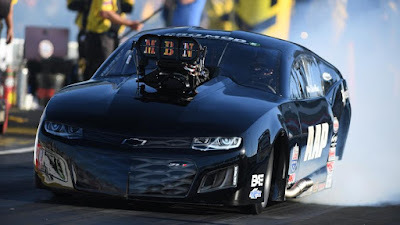 He met Brandon Snider another Al Anabi team in the championship registering a blistering 5.746-248.34 over snider at 5.812-245.14.At E2 lined up against Mike Caruso and left him on the tree to meet Stevie 'Fast' Jackson at the semis and lost. With the loss to Jackson,Mike Janis hopes to clinching the NHRA Midwest National event had faded out. But the team looks upbeat ahead of Texas meet where the road leads to next. ''There are 30-35 talented cars on the property every race''stated Janis on a social media comment.'' Stated Janis after Midwest Nationals. ''This is what makes it that much more special to be competingWe will keep digging and we aren't going to stop working. No sleep till Sunday night October 28th in Vegas.'' added Mike Janis. NHRA Pro Mod Drag Racing Series continues at the AAA Texas NHRA FallNationals on Oct. 4-7 at the Texas Motorplex located in Dallas.